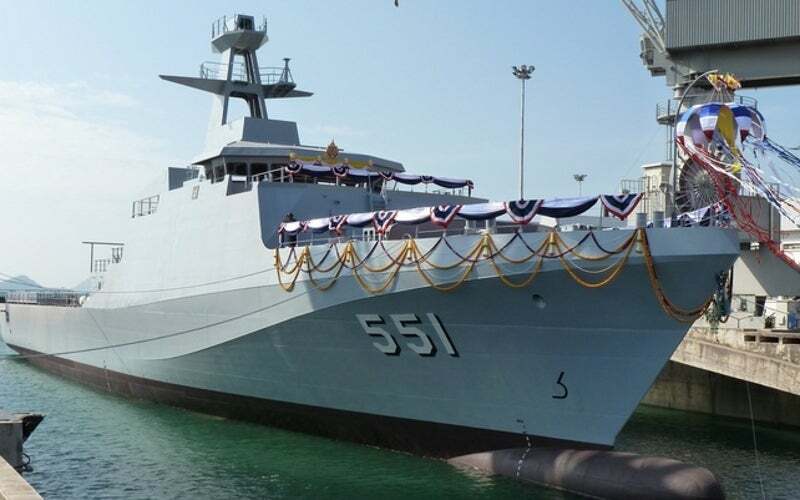 HTMS Krabi offshore patrol vessel is built by Bangkok Dock. Image courtesy of Saberwyn. HTMS Krabi entered service with the Royal Thai Navy in August 2013. Image courtesy of BAE Systems. The offshore patrol vessel is equipped with two MSI 30mm guns on port and starboard mounts. Image courtesy of Saberwyn. The vessel is armed with 76mm lightweight naval gun. Image courtesy of Saberwyn. HTMS Krabi seen during International Fleet Review 2013 in Sydney Harbour, Australia. Image courtesy of Saberwyn. The vessel is intended to conduct routine patrols, border control and fishery protection missions in Thailand’s exclusive economic zone (EEZ) and can also be deployed to perform disaster relief operations and natural resources protection in the Gulf of Thailand and the Andaman Sea. BAE Systems signed a technology transfer agreement with Bangkok Dock to supply the 90m offshore patrol vessel design for the construction of HTMS Krabi in Thailand in June 2009. Keel laying ceremony of HTMS Krabi (551), worth THB2.8bn (approximately $79.2m), was held in August 2010 and the vessel was launched at Mahidol Adulyadej Naval Dockyard in November 2011. It was inducted into the RTN’s service in August 2013 and has completed 1,000 days of operation at sea. HTMS Krabi took part in the International Fleet Review 2013 organised by the Royal Australian Navy in Sydney Harbour, Australia, in October 2013. In January 2016, BAE Systems received a contract from Bangkok Dock to provide design and engineering support for the second 90m offshore patrol vessel, which is estimated to cost THB5.5bn (approximately $155m). The design of HTMS Krabi vessel is based on 90m offshore patrol vessel, an evolution of the 80m River-class offshore patrol vessel (OPV), which is designed and built by BAE Systems for the UK Royal Navy. HTMS Krabi is 90.5m-long, 13.5m-wide and 7.7m-high, and has a draft of 3.8m. With a displacement of 1,969t, the vessel can accommodate up to 39 crew members plus 50 embarked personnel. The vessel is operated from the navigation bridge, located amidships. The marine radars and communications systems are attached at the top of the bridge. A large 20m flight deck at the aft section supports the operation of a Super Lynx multi-purpose military helicopter. The vessel also carries a rigid hulled inflatable boat (RHIB) on both sides to perform patrol and transportation tasks. The OPV is installed with air-conditioning and electrical systems, storage and accommodation facilities, as well as a crane to lift equipment. An Oto Melara 76mm lightweight naval gun, developed by Italian OTO Melara, is installed on the bow. With a rate of fire of 120 rounds a minute, it is designed to provide defence against shore-based targets. "HTMS Krabi took part in the International Fleet Review 2013 organised by the Royal Australian Navy in Sydney Harbour, Australia, in October 2013." Two dual-feed MSI 30mm guns, fitted on both port and starboard mounts, offer protection against light targets. The offshore patrol vessel is also armed with general-purpose machine guns. The second patrol vessel in the class can be equipped with a RGM-84 Harpoon anti-ship missile. HTMS Krabi is integrated with a variety of sensors developed by Thales, such as Lirod Mk2 fire control radar, Variant surveillance radar, FIT 10 Voice Terminal, Tacticos combat management system (CMS), FOCON IP communication system, MOC mk3 consoles, TSB 2520 IFF interrogator and combined interrogator transponder (CIT), and integrated communication system. Two MAN 16v 28/33D diesel engines, each developing an installed power of roughly 9,700hp at 1,000rpm, allow the vessel to sail at a maximum speed of 23kt. The OPV can operate up to a range of 7,800nm, when sailing at 12kt. Two controllable-pitch propellers are fitted aboard that provide better efficiency and high-manoeuvrability. For over 80 years, Vitavox has supplied the UK and MoD's worldwide with marine loudspeakers, handsets, headsets and microphones. Power Conversion Technologies (PCTI) has been providing cutting-edge power electronic solutions to defence, naval and commercial industrial customers since 1992.